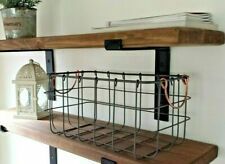 Shelf -Scaffold Board Rustic Shelves Industrial Solid Wood+2 Brackets. 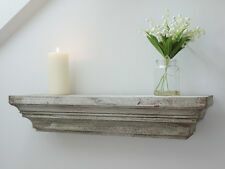 Shabby Chic Floating Shelf in Distressed Antique White Paint Finish. Antique white weathered finish. A really unusual unit with its stunning urban chic design. Easy to wall mount using 2 screws (not supplied) in the pre-drilled keyholes situated on the back of the unit. Books and plant are not included. We are professional manufacturer to produce TV Wall Mount,Dog Harness,Dog Bed,Make Up Trolley,Mirrors,Garden Stand,Solar Led,Car Holder products and 3C Accessories. Antique-style painted & carved wood eagle?. 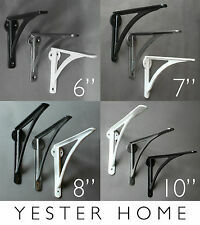 /stylised bird wall bracket. Size 430 x 355 x 128mm. /17 x 14 x 5". Wooden pigeon holes with eight holes approximately 30 x 8.5cm each. Overall length 66cm, height 44.5cm and depth 30cm. In good used condition. Delivery close to Cambridge possible with a small extra fee. Add to Favourites. Enter your text here. With a stunning acanthus leaf design. 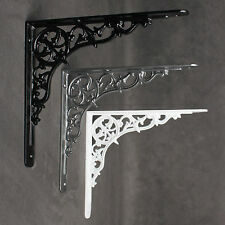 Beautiful antique style wall shelf. 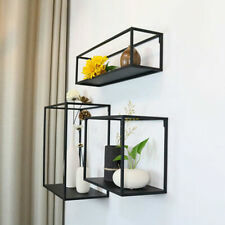 The top shelf is made of wood so could be mounted onto a pair of wall brackets. Finished in antique gold. Shapely half shelf at the top. ANTIQUE STYLE SOLID OAK BOOKCASE, BOOK SHELF. Condition is Used. Collection in person only. An oak adjustable bookcase with two large stained glass doors. The bookcase is in very good condition, it has been cleaned and waxed. There is a little colour loss to the front door, as shown in the last photograph. H ere is lovely painted cupboard. Very old and rustic. The overall condition of this is good, but rustic. Painted before arriving to us but has been lovingly done. Here we have a solid oak bible stand. Problems buying?. now by hitting the BUY IT NOW button. H ere is lovely display cabinet. Slim design. Small piece of beading missing on the left side. The overall condition of this is good. If you are within 70 miles a smaller fee will apply. Adjustable height shelving. Here we have a pair of 20th century bookcase. Problems buying?. Matching pair. 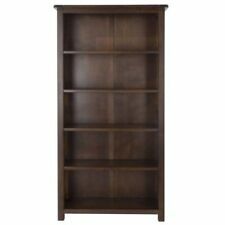 Here we have a beautiful large open bookcase. Lovely carved detailing. Grey painted finish (done before arriving to us). Problems buying?. Painted before coming to us. Later dowels. About Mango Wood : With its characteristic grain pattern mango is a beautiful hardwood. As mango wood is hard and dense wood it is excellent for making the furniture. The diverse colour and shades allows each piece of furniture to exhibit colour variations unlike any other wood form a multitude of browns to shades of yellow. 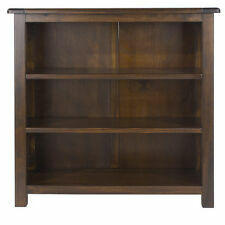 A really quality made bookcase made from solid pine with a boarded tongue/groove back. It has been skilfully finished and the top has been left in a natural wood finish while the rest of the bookcase has been painted in a chalk paint finish in a shabby chic style. Here is a lovely period bookcase. Large glazed panels to both doors. Sizes = Height 128cm Width 135cm Depth 37.5cm. Problems buying?. Condition = Very good, lockable with key. Possible later in date shelves. INDUSTRIAL PIPE BRACKET PAIR Heavy Iron Shelf Support High Quality Flange 1/2"
4 Tier Duck Blue Wood Mirrored Cabinet Wall Mount Storage Unit Shelving Furniture In good condition, wear and tear that comes with old age, some marks on the wood, please see pics for more details. Dimensions : 40cm by 30cm and 5.5cm deep, the shelves are 3.5cm deep, 27cm wide, the space between shelves is 8.5cm tall (10cm tall at the top ) Collection from Bognor Regis or I can ship for £ 7.99. A lovely size that can be used in many rooms from kitchen to dining room to bathroom. Small cabinet/dresser or storage unit. 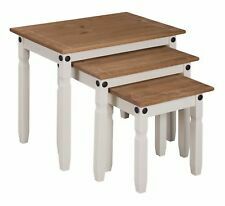 We have for sale this great piece of multi use furniture. Features three drawers, two cupboards and and lovely ceramic handles. CURIO CUBE/PIGEON HOLE. VTG WOODEN MINIATURE DISPLAY WALL SHELF. Nicely finished with an attractive wooden trim around the edge. Each shelf internally is 3" high x 3" wide x 2.25" deep. There are a few small marks here & there but nothing to worry about. Antique Dark Wood Bookshelf, Bookcase. 3 Shelves. 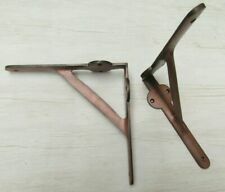 H 75cm, W 86cm, D 22cm. Solid and heavy. In the kitchen, this rustic shelving unit can hold supplies and kitchen appliances. Material Steel solid fir wood. As its retro print suggests, it will be ideal for the bathroom but it can of course also be used in other rooms. Antique Secretaire Bookcase. This wonderful antique cabinet is a practical and elegant piece of furniture. 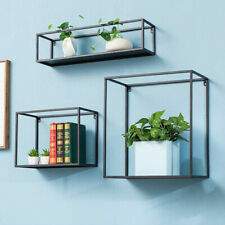 It will look great displaying china, glassware, books, etc. The door's glass is original. Working locks and key. Steampunk Shelf / Shelving / Bookcase - Made From Black & Brass Pipe Fittings! 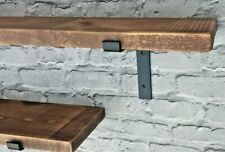 Reclaimed CHUNKY Wood Shelf, With 6" GWR Cast Iron Antique Brackets. Reclaimed Pallet Wood Shelf, complete With 6" GWR Cast Iron Antique Brackets.